Growing up, my brother and I did not have any kind of special relationship. We did not dislike each other but we did not like each other either. I guess you could say we had one typical brother-sister relationship. I had crushes on his friends just about every week and he found my friends a bit too Strawberry Shortcake for his taste. We had wrestling fights, screaming fights, pillow fights and he often hid in my closet to scare me before bedtime. Typical. I often wondered if we would ever find some common ground. Some place of understanding. We did find it when our brother passed away. Right there, in front of me, stood a broken man. He was not this "my brother-this pain in the rear" boy anymore. He was in pieces. I was too. And we picked them up together. We held each other up and found each other then. There is no reason why things happen. They just do. And we knew what we had to do then. And we still do it. Our way. We still don't call each other that often. Or send cards. Or email. He knows I got his back and he's got mine. He's always smart with business and techie advice for me. He loves food and is an amazing cook. He gave me two beautiful and smart nieces. "Hey, I really like when you write me a post on your blog for my birthday. I also really like when all your virtual friends come wish me a happy birthday." Silence on my part. A bit surprised that he would admit this. I laughed. Out loud. Then I apologized and promised that, yes, I would post something on his birthday. I virtually made him some (gluten free) Upside Down Pear and Cardamom Cakes that we quickly devoured last night. As a kid, his birthday dinner would always include frog legs with tons of parley and garlic and a chocolate cake with walnuts and oranges that I was not particularly fond of. I did think about making it for him again as a wink to the past but my mom had brought over the new French Saveur and Elle a Table and I kept coming back to the article on upside down cakes in Elle a Table. So many variations from one simple base that it would have been difficult not to find one that suited everyone. I adapted the base recipe to make it gluten free and added some cardamom to the ripe pears I used in the cake. There is something about pears and cardamom that is almost magical once baked together. Instead of doing the cakes and the caramel with sugar, I used wildflower honey. I am really enjoying baking with sucanat, honey and maple syrup versus regular granulated sugar these days. So much more fragrant. So many more health benefits too. The cake was moist from the millet and sweet rice flour, oozying with honey and vanilla bean caramel, and the smell permeating the kitchen was unbelievable. We quickly brewed some fresh coffee and sat down with some cake. So here's to you Arnaud! Happy Birthday! Joyeux Anniversaire! Preheat oven to 350F. Line the inside of four 4-inch springform pans or one 8-inch pan with parchement paper. Place the pans on a baking sheet and set aside. In a large heavy bottomed saucepan, place the honey, water and vanilla bean seed and bring to a boil over high heat. Reduce the heat to medium and let the syrup simmer down until thickened, should take 5-8 minutes. Remove from the heat. Divide the caramel among the prepared cake pans. Divide the pear slices among the bottom of each cake pan and set aside. In the bowl of an electric mixer, beat the eggs and honey on medium speed for about 2 minutes. Slowly add in the melted butter. Add the flours and cardamom and mix until fully incorporated, about 1 minute. Divide the batter in between the pans and bake for 30-40 minutes or until golden brown. Remove from the oven and let cool to room temperature. Unmold carefully over a plate. Watch out for the oozing honey caramel. Wow! This really looks wonderful...Nice job! Oh and....Happy Birthday Arnaud! Happy Birthday Arnaud! I hope that you enjoy your day, this year and your sister's creation =D. Helene, this is stunning! 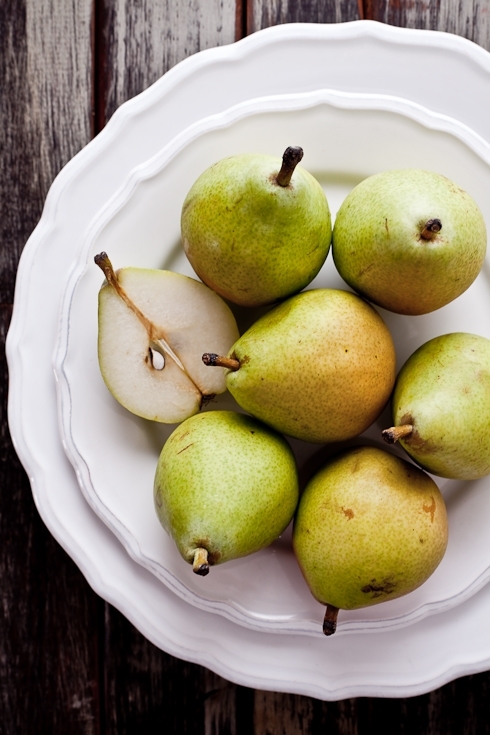 I always love to see how you make recipes gluten-free, and those pears look sensational! Very beautiful, Helen, and I LOVE that spoon in the last photo! How delicious and beautifully illustrated! An excellent (read: yummy) reason to try alternative flours and cook gluten-free, if not for health reasons, at least for culinary ones. Ma petite famille et moi voulons souhaiter un très Bon Anniversaire à Arnaud, et beaucoup, beaucoup plus! Le gâteau de poire semble positivement divin. Gros Bisous! I love your personal story with the food. A kind of cooking personal essay. It gives the blog a deeper dimension than only recipes and beautiful photos. What beautiful little cakes. Happy Birthday to Arnaud! Beautiful photos, you really give the food justice with your images. Lovely cakes and pictures, Helen! Happy Birthday Arnaud! The cakes Helen made in honor of your birthday look fantastic! How would I convert to regular whole wheat or all purpose flour for these cakes. I would love to make them but do not want them gluten free. They look beautiful! Thank You! "Like Christmas had come in March." that is so beautiful! The love you guys have for each other doesn't need to be posted everyday....it sounds like it is understood from within. A great big Happy Birthday to your brother. We are all indulging in his birthday treat created by his loving sister! Kathy: I am not sure about whole wheat but the recipe in French for all purpose flour stated 150 grams. Hope that helps. what a nice story,and I know you guys love each other with your own way :) Happy Birthday Arnaud. ooo this makes me dream of when I lived in Lyon ... but the thought of it being gluten freeis simply wonderful!!!!!!! Happy birthday to dear brother Arnaud! Lol, Happy Birthday Arnaud! Hope you had a good one!!!! Happy birthday, Arnaud! I wish I had a sister who made such lovely cakes for my birthday. 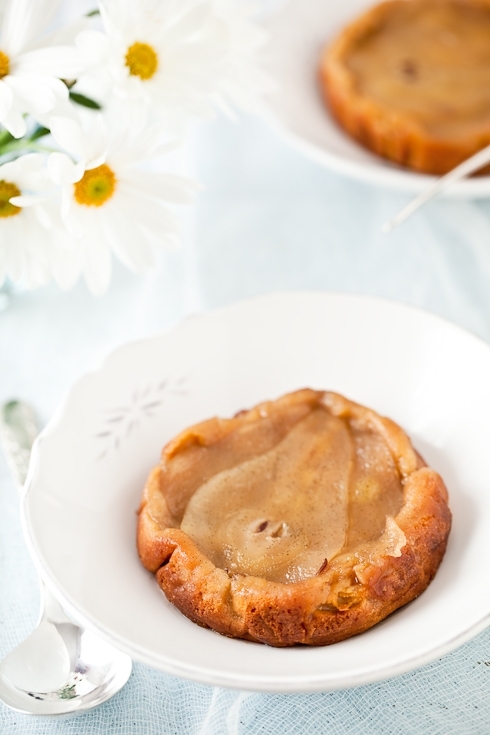 The upside down pear cardamom cakes looks absolutely divine! Anyway, I just want to thank you for the wonderful macaron recipe that I got from your blog. I tried many other online recipes and only yours seems to work for me. I finally made a successful batch of macarons. :) Thanks again! What a lovely story. I have no brothers but I know what you mean by this type of relationship. Being the oldest of 6 girls in my fanily, it's an act of tough love. The cake looks absolutely stunning! I can't wait to try it out. Happy birthday Arnaud from Down Under (Sydney)! :) It's a gorgeous day here, and I hope you have one too! Yum that looks tasty I love cardamom!! Joyeux Anniversaire Arnaud de la Californie! Beautiful, beautiful post. I love the last photo with the simple daisies, the texture of the background and of course the delicious looking cakes! This sounds lovely. We just bought our first local pairs today at the farmers market in Seattle today. Such a shame we waited so long! I look forward to trying this. Joyeux Anniversaire to Arnaud from Switzerland. Helen, I love that you use honey in stead of sugar and gluten free flours in this recipe. I need to stock up on gluten free flours, but today, since I have some pears, I will try to use it with all purpose flour. it's quiet here...& i have tears streaming down my face...you touched an emotional chord helen, as this post is so tender & filled with love...with that i wish you dear brother a very wonderful birthday. Such a nice post to celebrate your brother's birthday. I think all brother/sister relationships soften with time. I love the pear and cardamon combination. These look lovely. I do not need to eat gluten free, but may try these exactly as you made them. "happy birthday to you; happy birthday to you. happy birthday dear Arnaud...happy birthday to you"....and many more! Greetings from Texas. Beautiful dessert - will definitely bake. Happy Spring all...it finally arrived. Hi there, instead of superfine sweet rice flour and millet flour could I use normal flour? And which would be best plain or selfraising? MMMM...sounds like you guys had a great day! What a beautiful post about you and your brother and, fittingly, a beautiful celebration dessert. What a lovely post. I think it's so heartwarming to see how our blog can impact our real-life relationships. And I'm happy to hear your brother is realizing what a talented sister he has too. A very Happy Birthday to your wonderful brother! And thanks for the great blog too! the crust & filling actually "come alive"...& look so tempting!! What beautiful photographs (as usual)! A very happy birthday to your brother, and hats off to you for another gluten-free baking success. They are delicious as they look. No millet where I live in the Kentucky wilderness, so my daughter made the batter with an equal amount of supermarket cake flour. All agreed they were not too sweet, but nobody asked about the butter bomb. Congratulations to Arnaud and your spouse. Joyeux Anniversaire, Arnaud! What a lovely-sounding treat. Cardamom is one of my favorite spices. Ah, what nice pear tarte tatins, beautiful! Hang on, am I allowed to call these tarte tatins, or is there something different in the process of making them? Beautiful pics - looks delicious! Well, I can relate! My brother and I did not get along AT ALL when we were kids, but as adults he is a confidant to me:) Anyway, this pear cake looks sooo beautifully delicious!!! Happy birthday to Arnaud! Stefania: you can use 150gr of all purpose flour. 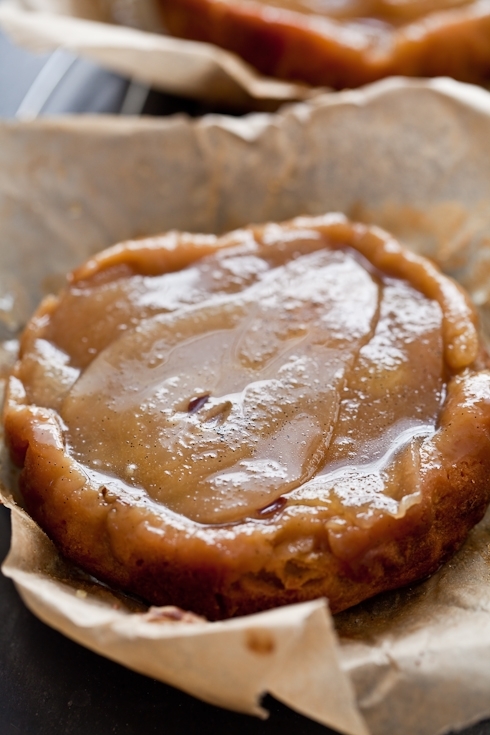 Anne's kitchen: they can't be called tartes tatin as they are not tarts but cakes. Bonne anniversaire Arnaud, et je vous souhaite un bon an ! 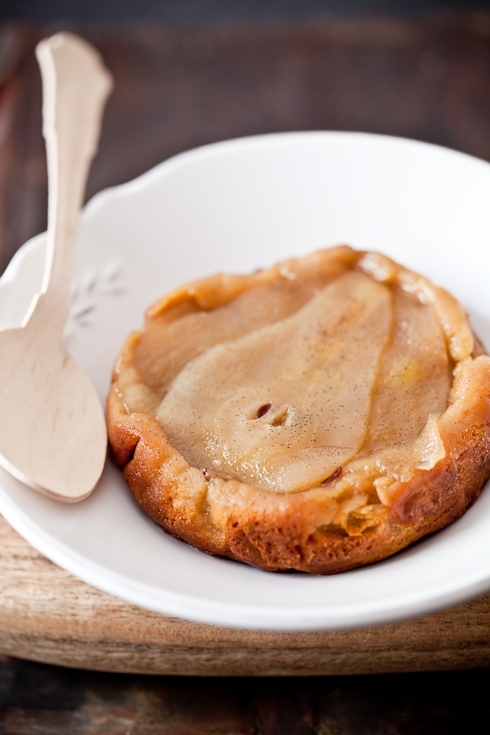 Cette petite tarte tatin aux poires est trop mignonne, j'en prendrais bien un bout !! I've been drooling over these upside down cakes in Elle à Table since I bought the new issue... Your version looks scrumptious! I never was really close with my brother, and now that he is moving abroad next month I wish we had spent more time together. I did make him a cake for his birthday too. What a sweet story! The pears look absolutely divine. Just Beautiful! I lost a brother, too. Isn't it amazing how it changes the dynamic so with your other siblings? Love to you. I love my brother too! Joyeux Anniversaire Arnaud, from British Columbia, Canada! Thanks for the lovely post and for the great recipe. My mother always brings me the Elle a Table when she comes over! Joyeux Anniversaire a Arnaud! I love that he said that too. Happy Birthday Arnaud! You are thought of on your brithday. Isnt it nice getting well wishes from around the world. Cheers! Happy birthday to your brother! These pictures are amazing- I want to climb right into them and eat these tasty treats! Happy Birthday Arnaud. Your brother is funny and yes, it's typical brother-sister relationship. My brothers would practice kung-fu and wrestling moves on me. Can't wait to try this, it looks luscious!! I'll probably use the 150 g AP flour though. hello, i tried to find an e mail for the blog, but could.t and didnt want to write on the "proffesionnal" one. i would like to ask you if you would consider giving a macaron workshop in Greenville, Sc. it will be our Honor and pleasure to be able to attend such an event. as i see you moderate your comment, so you can delete this one, i am just writing to touch bases with you. please let me know, thank you for your time and for your blog, i love it! A little late, but happy birthday Arnaud! This recipe seems absolutely scrumptious, and the photography is fantastic! This is so touching...happy birthday, Arnaud. The cake sounds and looks beautiful... cardamom and pear together is a wonderful idea I will have to try soon. I'm late to the party because I just started reading your blog today, but I'd like to wish your brother a happy be-lated birthday because this post was so touching and the recipe looks so good. Happy belated birthday to your brother! Hi there, could I exchange the rice flour for almond flour? Thanks so much. 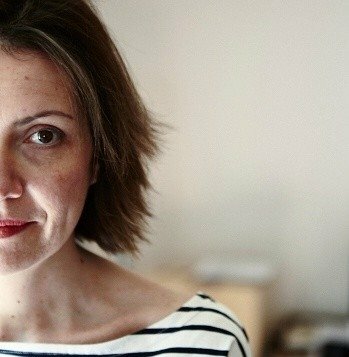 Gosia: I don't see why not but I can't vouch for the result as I have not tried it that way. If you do, let me know how it turns out. What a touching post and beautiful little cake. I'm really looking forward to pear season so I can try this! But in the meanwhile would you be so kind as to explain to me why is there no baking powder/baking soda listed in the ingredients? I find this absence intriguing. 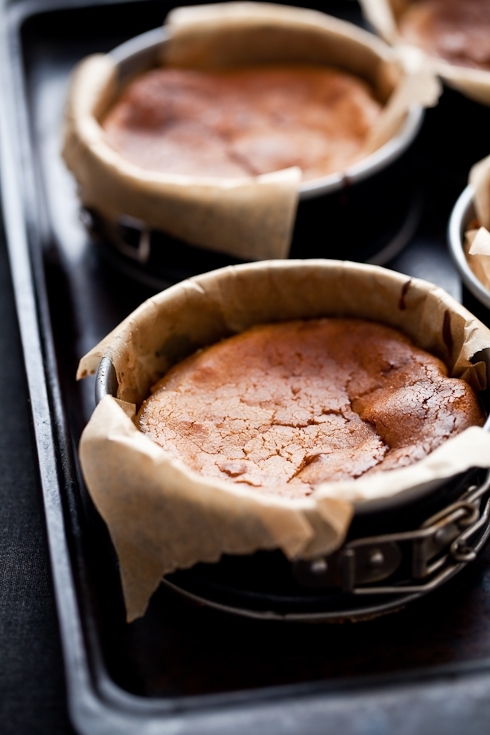 Mila: well, not every cake requires either baking powder or baking soda.